1. GM's CEO on the hot seat. 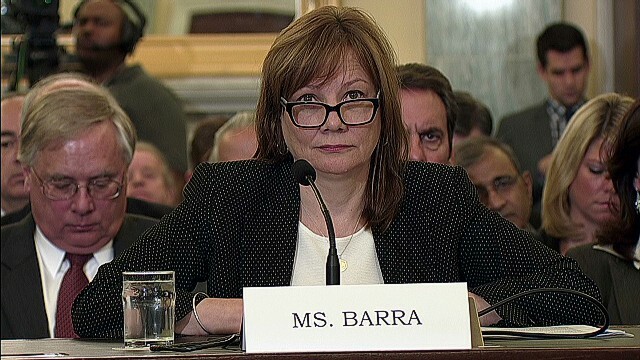 For a second straight day, General Motors CEO Mary Barra faced a grilling from lawmakers about an ignition switch defect linked to the deaths of 13 motorists. The problem led to the deactivation of airbags and cut off engines, power steering and brakes in some of GM's small car vehicles. Barra, who has acknowledged that GM knew about the ignition issue as early as 2001, said an independent investigation is underway and stressed "the new GM" has differently since the 2009 government bailout. But one senator warned Barra the automaker could be looking at criminal charges. "The more I learn about what happened before the reorganization and in connection with the reorganization the more convinced I am that GM has a real exposure to criminal liability. In fact I think it is likely and appropriate that GM will face prosecution based on this evidence," Sen. Richard Blumenthal, (D) CT, told Barra. 2. SCOTUS: It's only money. The Supreme Court has struck down limits on how much cash single donors can give to political campaigns. Wednesday's 5-4 ruling means a donor can give as much money to as many campaigns as desired as long as no single candidate receives more than the current $5,200 limit during an election cycle. At issue was whether current campaign finance laws violated the free speech rights of contributors. In writing the court's conservative majority opinion, Chief Justice John Roberts said donation limits "intrude without justification on a citizen's ability to express the most fundamental First Amendment activities." Republican leaders praised the decision as a victory for free expression, while some Democrats and other supporters of the limits expressed disappointment, saying it further allows special interests to have even more influence on elections. 3. Obama zeroes in on minimum wage. With his health care law's problems behind him for now, President Obama is back to pressing for an increase in the federal minimum wage. The president traveled Wednesday to Ann Arbor, Michigan and slammed Republicans for Congress' failure to increase the minimum wage from $7.25 to $10.10 per hour. "Here's the problem. “The GOP in Congress, not in America - in Congress - don't want to vote to raise it at all. Some want to scrap it – saying it outlived its usefulness," Obama told a crowd at the University of Michigan. Although the chances of Congress passing a minimum wage increase are nil heading into this year's midterms, Democrats see the issue as a winning one in their campaign battle. 4. Dems focus on Ryan budget. Democrats will also be using Rep. Paul Ryan's budget in their uphill battle to regain control of the House. The former Republican vice presidential candidate's plan calls for balancing the federal budget over the next decade by repealing Obamacare, implementing changes to Medicare and cutting social programs like food stamps. "Let me give you three words that will define the next seven months: the Republican budget," said Rep. Steve Israel, chairman of the Democratic Congressional Campaign Committee. "They should have just printed a middle finger to the middle class on page one of this budget."